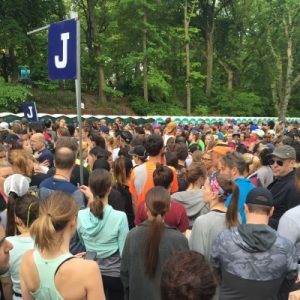 The AirBnB Brooklyn Half is just over a week away! Over 60 members of #CHRC will be running this year’s race so you’ll be in great company! As you get tapered for the big day, we want to help you celebrate all that you have accomplished to this point in training and the important day. 13.1 miles will be over before you know it so let us help you make the most of it! This is our 3rd Club Points race of the year so for all those #CHRCWomen and #CHRCMen vying to make our standings count (top 5 CHRC finishers in each category), there’s plenty of motivation to power through! Let’s go #RunningRoyalty! Join your fellow royals as we talk about what to expect on race day. 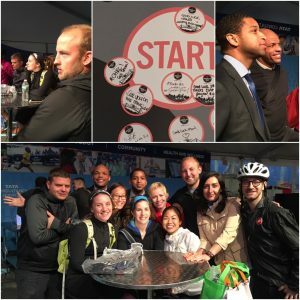 From pre and post race tips to strategies for the course itself, let’s get all prepped for a great day in Brooklyn! Get your pre-ordered new and fresh running club gear so you can be fully ready for the main event! 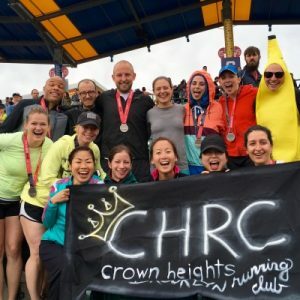 You can test them out in the coming week, and get ready to wear your #CHRC gear on race day — much easier for cheer team to spot you on the course! Meet Kay at the Brooklyn Museum steps for a jog down to Brooklyn Bridge Park to pickup your pre-race packets, check out gear, go through a coaching of the course, drink a beer and watch the sunset over Manhattan. Kay will have any CHRC gear that was not picked up over the weekend. This is your last chance for gear pick-up! Not able to make the run but stopping by the Pre-Race Party? Let us know! We’ll meet you there! ***Please note: there is NO race day pickup. *** Don’t forget your ID! Your QR Code is available on your MyNYRR Page, or from any other NYRR race you’ve run. Weather: 64 degrees F, mostly cloudy at 7a, with light 7mph winds. PACING: Why run alone? Record your goals and collaborate with Team CHRC with this wonderful spreadsheet! PHOTO, RESTROOM, WARM-UP: Please meet us at 6:20AM by the Botanical Gardens for a team photo, and then a warm up job! 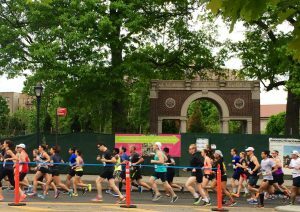 Restrooms are available beside the Botanical Gardens, and on Eastern Parkway just east of Underhill Ave.
For those of you NOT racing but want to participate in this all Brooklyn event and cheer on your teammates or clubmates, we will have a CHEER STATION! 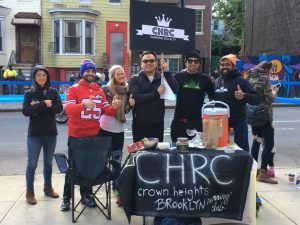 We’ll be stationed on the southwest corner of Ocean parkway and Avenue U with the CHRC banner and signs. We expect to start seeing runners a little after 8am. Racers, with about 5K to go, don’t forget to look for us for your personalized high-five and super #CHRC boost! Please feel free to bring snacks & drinks for the cheerers (donuts, coffee, margaritas…etc) and the runners (bananas, oranges, gu…..). We’ll pack up around 11:00am and join the Post Race Celebration at L&B Spumoni Gardens! HUZZAH!! YOU DID IT! Let us help you enjoy the rest of your day and your recovery! Look for #CHRC at baggage claim in MCU Park! Please check in with Gideon (check your email for his cell number), even if just to say you finished, but we hope to see you at baggage claim or Breakfast! ***Note: Cellular service is usually spotty at the park and finish! ***Breakfast/Food/Celebration***: The Finish area is quite a zoo and it may be hard to find each other. Once you’ve stretched out, gotten your things and enjoyed a beer in the park, Join us a little bit away for a slice of Sicilian at Spumoni’s! Walk yourself over (you can do it!) to the D train at Coney Island/Stillwell Ave, ride 2 stops to 25 Ave, and walk on in! If you have any questions or concerns, please feel free to contact Gideon.